Marroquin has worked with video since 1968. One of the pioneers of European video art, his work has been exhibited in ICA London, MOMA New York, Stedelijk Museum Amsterdam, Centre Pompidou Paris, Moderna Museet Stocholm, Museo Reina Sofia Madrid, etc. His single channel works, objects, composites and installations are part of many private and public collections in Europe, the Americas, Australia and the Far East. From 1971 to 1978 Marroquin published Fandangos, an artist magazine. This was followed by other initiatives like the Kremlin Mole published in Amsterdam during the 1980s. After a series of experiments with Belgium, British, Dutch and German national television stations, Raul Marroquin began to explore the possibilities of cable in Amsterdam (1977). In 1990 he co-authored Time Based Arts Television, later that year he created De Hoeksteen Live Television with stage actor / director Titus Muizelaar, De Hoeksteen is a political, financial, cultural program transmitted live every last Friday of the month 23:00 - 03:00 C.E.T. He lectures and conducts workshops on a regular basis: Center for Advanced Visual Studies Massachusetts Institute of Technology, London School of Economics and Political Sciences, Universidad Nacional & Universidad de Los Andes, Bogota, Rietveld Academie (Amsterdam) Jan van Eijck Akademie (Maastricht) Minerva (Groningen) Aki Enschede in the Netherlands, Alternative Media Studies New York University and others. Marroquin writes for his own blog and contributes with articles and essays for scientific and special interest publications. This Internet art piece explores metropolitan traffic web-presence and social media interactivity. 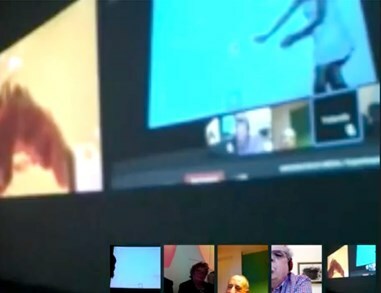 Web technology enables users to intervene from remote locations and insert their perspectives into the art encounter. Daily public live cam coverage and simultaneous field cast reporters via Periscope will cover Miami traffic. These web cams will map a social media syndicated multi newsroom that will host daily live commentary and analysis. This art encounter will explore live communications by way of Google browsers and apps like Twitter, Facebook and Instagram; tracking the informational flow of ground, areal and maritime traffic. Daily off-site launch of a drone will broadcast Wynwood areal status using a GoPro live cam and Meerkat.